Update 2015-10-29: This is now a joint presentation with Seth Westra presenting on the ARR methodology and Duncan McLuckie and Grantley Smith presenting recent work of practical guidance from the NSW Office of Environment and Heritage. Seth is an academic and chartered professional engineer with 13 years of postgraduate experience across academia and industry, with expertise in extreme rainfall and flood risk estimation, hydrological modelling, water resources planning and management, and climate change impact assessments. He leads the University of Adelaide ‘Water Systems’ research group in the School of Civil, Environmental and Mining Engineering, and chairs the Australian Energy and Water Exchanges (OzEWEX) committee on trends and extremes in Australian natural hazards. He has contributed to several chapters of Australian Rainfall and Runoff, and has won numerous awards including the Water Industry Alliance ‘Minister’s Award for Excellence in Water Sustainability’ for a project on assessing the risk of climate change on Adelaide’s water security, and the Australian Institute of Policy and Science ‘Tall Poppy’ award. 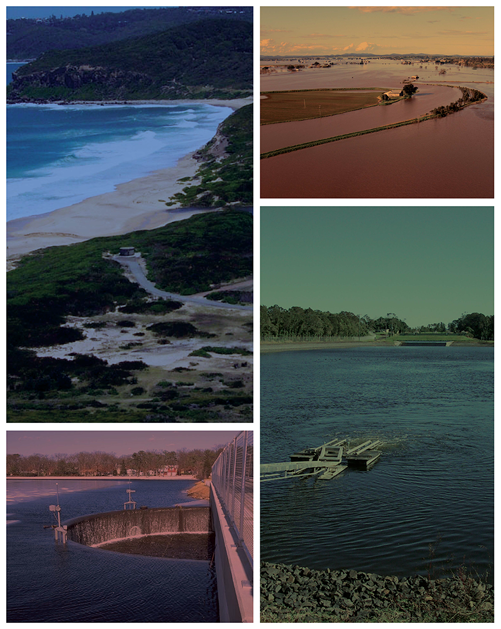 Duncan is the Principal Flood Specialist in the NSW Office of Environment and Heritage and Visiting Fellow at the University of Technology, Sydney. Duncan has extensive experience in hydrology, hydraulics and water resources, having worked in the field since the 1980’s. He is the lead author of the recently released Australian Emergency Management Handbook 7: best practice in flood risk management in Australia and led the development of a range of associated guidelines. He was also a main author of the NSW Government’s Floodplain Development Manual (2005) and it’s supporting technical guidance. Duncan’s expertise is in flood risk management. He works at a strategic level with other agencies and industry and on working groups on a range of flood risk management policy, technical issues and industry education initiatives. He has also presented a wide range of papers on a broad range of flood risk management topics to state, national and international audiences over the last two decades. Grantley has specialist expertise in water resources management through a hands-on career investigating catchment processes. He is acknowledged by his peers as an expert in modelling catchments and floodplains and was instrumental in the pioneering use of 2D hydrodynamic models for floodplain flow prediction and inundation mapping Grantley is a lead author and key contributor to reports supporting the the national best practice manual Managing the floodplain – a guide to best practice in flood risk management in Australia (AEMI Handbook 7) and the revision of Australian Rainfall and Runoff. He has a particular interest in quantifying flood hazard exposure for the community and infrastructure and is looking forward to testing the response of a car in floodwaters at full scale in the near future.